Better the devil you know? I’d be devastated if that’s what my customers thought of me. I want to be known as an Account Manager they can trust. Someone who has integrity and credibility. I used to think trust and credibility came with my job title but discovered, in fact, they must be earned. Adopt a gratitude mindset. While of course it’s a two-way street and you are providing a solution that your client values, I still think it’s important to appreciate that without your customers you wouldn’t have a business. Here’s a simple exercise: write down 3 things you enjoy, like or a grateful for when it comes to your customers. We all have bad days, even our customers. You’ll quickly establish your credibility if you approach your partnership with optimism. Be the type of account manager who helps their customers see the possibilities in their partnership with you and takes the steps towards achieving that potential. Your customer will soon learn to trust that you are someone they can rely on during adversity because you have helped them come out the other side. to the tune of the nursery rhyme classic, Frère Jacques. We teach children to be polite but often we forget as grown-ups the simple art of thank-you. I just wanted to drop you a quick note to say thank you for your support in arranging the presentation to your Leadership team this week. I really enjoyed the meeting and have already had some encouraging feedback on the proposal we shared – couldn’t have done it without you. Have a great week and talk soon. Not only is this a terrific way for building trust and credibility with your customer, it’s a nice thing to do. As an Account Manager, you’ll have clients from a variety of industries and your main contact is likely from the purchasing team. If you stumble across an opportunity to connect your clients then make the introductions. For example one of my clients was looking for new premises and another of my customers was in commercial real estate, so I put them in touch. I didn’t need to do any more than that but it certainly saw my credibility as an account manager and influencer skyrocket (well at least with these two customers!). The secret to building trust is to be a great listener. Let your client do all the talking. Not only will you build instant rapport and likeability, they may end up spilling some gossip (in which case they have no choice but to trust you). Read 45 Questions To Ask Your Client When They Just Don’t Care for some great ice-breakers and conversation starters to really get to the core of what matters most to your customers. Don’t sell your customer something they don’t need. Your goal as an Account Manager is to learn about your clients’ pain points. Show your client how you can solve them. If a product or service is not fit for purpose, if it’s not quite right – then come clean. It’s far better to be honest upfront then deal with the fallout later when they realise they’ve bought a lemon. This doesn’t just fail to build trust and credibility, it destroys it. A potential client setup a pre-implementation meeting with me prior to making a decision on awarding the contract. We went through every aspect of our product in detail. There were some gaps, of course. Some of the reporting and billing solutions didn’t meet what they were looking for and I told them so. The client responded to say that he appreciated my honesty and that it wasn’t a deal breaker – now that he knew how things worked he could manage expectations internally. We won the contract and I had one of the smoothest implementations I’ve ever had with a customer. Your client expects their Account Manager to be an industry expert and to know the benefits of their solution. So try sharing the occasional article that relates to your (or their) business. Perhaps recommend a book you’ve read or a podcast you listen to or a new study that was just released. Don’t just rely on your company’s marketing newsletter. Twitter is a great place to find this type of content. I’ve set up a Business Trends Twitter list so I can scan for new whitepapers, case studies and articles from sources like Harvard Business Review and KPMG. You can subscribe to my Twitter list HERE. Nothing establishes credibility like a strategic plan. As an Account Manager, you need to understand your clients’ needs, their priorities and how they’re measured. Then you can build a strategic plan by identifying opportunities and listing the actions you’re going to take to achieve them. Check out a recent post in which I show you how to create a strategic plan including a free template. When my mother chased me to do my chores, I usually yelled: “I’m going to”. Her reply was always, “Going to never did”. Don’t be the type of Account Manager who’s always missing deadlines and promising to get around to it. If you make a commitment, meet it. When you’ve delivered, follow up. Ask your client if things are as they expected, what impact it’s made and get feedback. Sometimes things happen. People let us down, we forget, technology fails… all sorts of reasons. Let your client know ASAP. If you’ve missed a deadline, make sure to phone (not email) to apologise and discuss next steps. Don’t miss it a second time. Building customer trust and credibility depend on your reliability. What do you think? 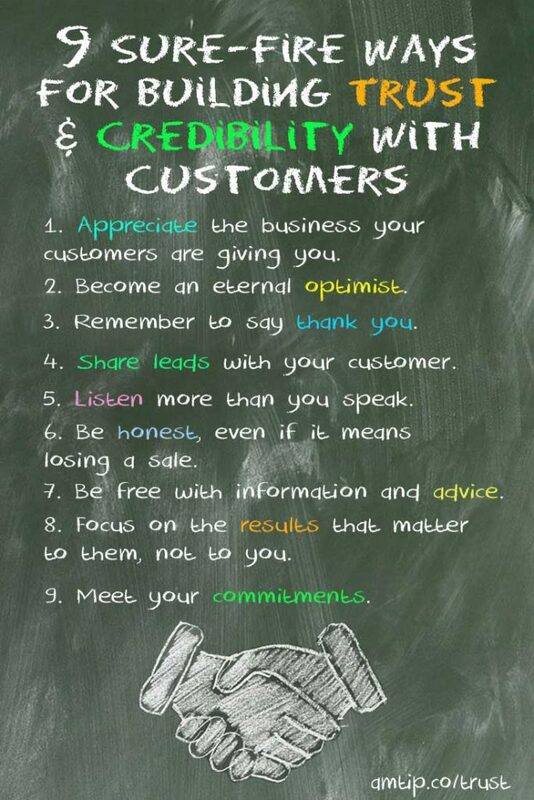 If you have any ideas on building trust and credibility with customers please comment below, I’d love to hear from you. Thanks for the fantastic article on creating trust with customers. It’s true, we are all human and fail at times but we can all help each other be better.